These terms are for a website that acts as an intermediary or marketplace between buyers of events or activities, and either the event organisers or resellers. The type of event could be as diverse as concert tickets, sports training, theatre productions, motivational courses, or spiritual retreats, or a combination of different types. These are T&C for a website that connects event attendees with third party organisers or ticket resellers. Specifically, it sets out the terms with the buyers of tickets. This document serves two main purposes. First it protects you in law from a huge array of potential problems arising from disputes between the event organiser and the ticket buyer. Secondly, it enables you to set out how your website works to benefit the organiser or reseller. You will benefit from having standard terms for all ticket sellers so that a buyer can return to your site on multiple occasions and buy from a different seller without the terms being markedly different. Website T&C are probably the best example of a legal document where use of plain English strengthens the legal effect of the document. If a dispute should arise, it would be hard for a visitor to your site to claim that he did not understand, even if English is not his first language. 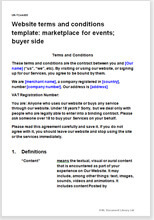 The most appropriate corresponding document for this one is marketplace for services; seller side. The law in these T&C is largely common law that deals with the basics of contracts: offer, acceptance, price and payment, provision of service, liabilities and risk. By and large, you can set the terms you want, to match your business model. The document can be edited easily so that it reflects exactly how your business works. Our guidance notes will tell you what you can change safely, and what we don't advise changing. This template allows you to comply with the raft of consumer protection legislation. It is assumed that ticktet buyers will be able to interact with your site in many ways, such as posting reviews or contributing to forums. We have therefore provided very wide ranging protection to protect the intellectual property on your site. This might be more than you need, but if not needed, you can easily edit it out by deletion. Additionally, there are over 3,000 words of drafting notes to help you. "Brilliant. I am most grateful to Net Lawman. Your service standard is unparallel. I would strongly recommend any individual or organisation to Net Lawman."